Donald Davis was commissioned to do paintings for NASA in the 1970s and is now offering them to the public domain. 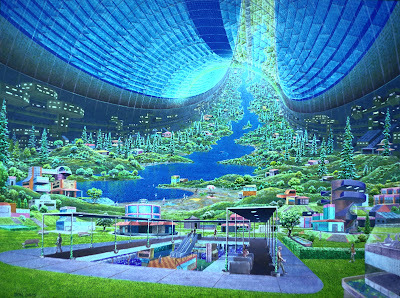 The "toroidal shaped space colony" above is an incredible piece of paleo-futuristic art from 1975. Click on the images to make them larger or visit his site to see all of his space paintings. It looks like the artist was watching Mobile Suit Gundam at the time. Um, MSG wasn't aired until 1979!! More like they were influenced by Davis' work than the other way around. Really, space futurism was alive and well for quite some time before their were anime shows about giant robots. are you sure these pics have never been seen before? because that first pic definitely has an eerie resemblance to a Microsoft video game by the name of... Halo. i am in stunned astonishment. It may not have been this exact painting, but Davis' works were well-circulated in the 1970s as promotional concepts for future space colonization. I remember Starlog, Omni and Future Life magazines publishing similar images during the period. The concept of a rotating, cylinderical colony as seen in Mobile Suit Gundam and Babylon 5 was developed by Gerard K. O'Neill at Princeton in the late 1960s-early 1970s and was first published in 1974 in Physics Today, later appearing in a 1977 book called The High Frontier. 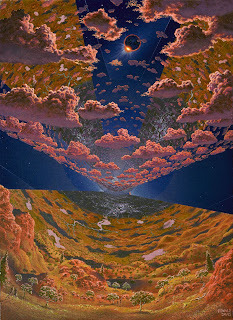 The concept is known, suitably, as the O'Neill Cylinder. Halo's design was inspired (loosely) by Larry Niven's Ringworld series. They're great books. Read 'em. I seem to recall seeing the first image in one of my favorite books, a National Geographic textbook called Our Universe. It beats the O'Neill habitat by two years. These are very very similar to paintings by Rick Guidice who also did NASA commissions. For anyone interested in these, and in the San Francisco area... The Wattis Gallery at California College Of The Arts has a couple of Guidice's up. First thing that sprang to mind was Mucky Foot's one and only Startopia. It featured a space station of similar design, with that exact style being the way the "Biodeck" looked. The first think I thought of when I saw these was, "Revdevous With Rama" by Arthur C. Clarke. I used to have a book with these paintings in it as a child. It was about the things that were going to happen in the future. I am sure these paintings are impressive. One should also see the "Space" paintings by artist/inventor Rick L. Silas www.coldbentglass.com or www.myspace/ricksilas.com as he uses the same contemporary materials as the space industry to create his multi-dimensional apprearing paintings on tempered glass. Quite stunning, and easy to escape into. No ordinary artist, Rick has invented all of his own artistic mediums and has even patented a process that allows him to bend glass without heat..really. Watch for him on the Discovery Channel's "Daily Planet he will be one of the featured inventors on the show in April during "Inventors Week"
You can find more NASA space colony artwork here. I actually just recently blogged about that. A bit late, but I live in huntsville, AL, actually but a mile if that from Von Brauns former residence. I'll shoot some calls to the USSRC here and then over to MSFC and see if they have any info on this video. They keep everything (they really do, notice they display a small 5x5" piece of debris from heat shielding from on of the apollo rockets in a lil display case) I'm sure they have this tucked away somewhere cool and dry just ready for a 25$ fee to copy to digital media, or we can hope. I'll see what I can dig up locally. Rama came out in 72, O'Niell was discussing this stuff with his students in 69. Rama was first to publication (a novel doesn't have to go through peer review), but O'Niell was already doing the calculations on the idea three years earlier. As a member of the Don S. Davis Fans Yahoo Group, I feel I should point out that this artist is not "General Hammond" from "Stargate SG-1". To colonize the solar system, we need to adjust our thinking a bit. We are planetary surface creatures. That is where we live, where we've evolved, and we're good at it. Living inside giant space ships is foreign to our thinking. But there is precious little usable planetary surface in our solar system, so it's very valuable.